Based on its cover design, it’s clear that Megalopolis‘ developers were trying to market a sim game. The image bears a striking resemblance to the insanely popular Sim City series by Maxis, and it’s no accident. 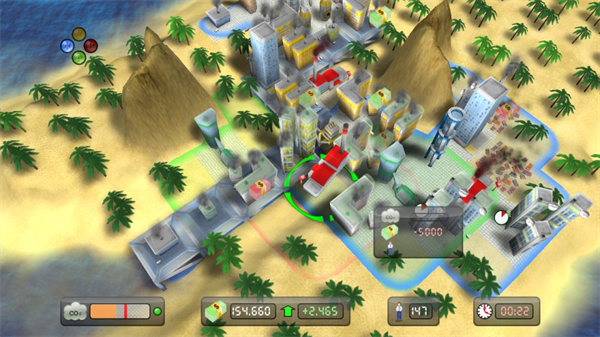 Megalopolis, however, is a unique game that offers its own brand of entertainment, and ultimately succeeds in being very different from the titles it uses to draw consumers in. But that’s where Megalopolis starts to get a tad confusing. After playing a few rounds of the main campaign, you’ll start to get a good feel for the controls and within twenty minutes you’ll be building cities and solving power crises with some level of skill. It’s at that point that you’ll realize you weren’t playing a sim game at all. Heads up, everyone: Megalopolis is an RTS. Yes, the game that so diligently tried to prove its similarities to the Holy Grail of sim games is actually a real-time strategy game in disguise. The main goal is to earn a certain amount of money by a certain time, all of which is hindered by the constant threat of slums. In Megalopolis, the slums quickly eat away at your money, take up building space, add to pollution and don’t count as tax-paying residents. Since money, pollution and population are the factors that determine whether you win or lose, the antagonizing force that attacks those factors can reasonably be considered your enemy. With that in mind, you fight hordes of slumlords by paying to have their slums demolished, and quickly build taxable homes in their place. This is not one aspect of the game; it is the whole game. You build your base and wait for upgrades to become available. You attack the enemy by destroying its bases. When your upgrades are ready, you apply them and your score multiplies. That is an RTS. Megalopolis‘ identity crisis doesn’t stop there, though. The campaign is about an hour or two long, broken into several 10-minute missions where you must accomplish a specific goal. Mostly, that goal involves earning X amount of tax dollars, or attracting X number of citizens. Other times, it involves keeping pollution at a certain level. Since you only have ten minutes to accomplish these goals, there are very few paths you can take. There are plenty of choices, but most of them lead to the slums (viruses) taking over more quickly than you can you can build your skyscrapers (pills). You can see where this is going. Each round of Megalopolis is a timed puzzle that you have to solve in order to move on to the next round. Once you’ve completed all the rounds, congratulations. You’ve completed Megalopolis. Astoundingly, none of that is actually bad. A puzzle game that uses RTS gameplay is pretty unique, and provides a very complicated but progressive twist on the classic formula of timed puzzles. That being said, there’s nothing quite like Megalopolis on the XBLI marketplace, and for over two hours of total gameplay, it’s a hell of a good time. Just don’t get too attached. There is no endless mode, nor any kind of long-term building experience found in sims and RTSs. Every ten minutes, all you have built will be erased forever, whether you win or lose. That’s intentional, of course, because as was stated above, Megalopolis is a puzzle game. Enter with that mindset, and you’ll sink a sizable amount of good, enjoyable time into this game. Unfortunately, you may find that your experience ends there, as the rigidity of the puzzles offers little room for improvement once you’ve mastered them. In the end, you will be glad for the time you and Megalopolis had together, but you won’t be calling her again any time soon. I'm an enthusiast and writer for video games and film, interested in criticism and sharing my thoughts & opinions with all of you.